Snow paints a pretty picture in landscapes and the winter wonderland it creates for kids is amazing too. However, it also poses a major hassle for businesses and homeowners. Whether you need to have your business’ parking lot plowed and cleared of snow or need snow removal from your driveway, its best to hire experts for the job. 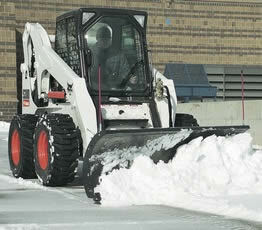 For all types of snow plowing and removal solutions, we are the experts to call. At Keenkut Landscaping, we are passionate about what we do and it’s how we have built a vast customer base in and around Westfield, Agawam, and West Springfield. Our high-quality services have earned us the trust of commercial and residential clientele in Longmeadow, Springfield, and Chicopee. Each year, we handle a large number of snow removal& de-icing jobs on properties in Windsor Locks, and Holyoke. Word of our expertise has spread to East Longmeadow, Easthampton, and the surrounding areas as well. We ensure the total satisfaction of all our clients by following methodical processes and time-tested techniques when working on snow removal & ice management projects. Whether these jobs involve clearing small residential properties of snow or clearing snow and ice on large residential estates after a severe snowstorm, we always guarantee the best results. We have countless satisfied customers across the region and a large number of repeat and referred clients too. This is a clear indication that clients trust us to provide them with the best services, each time they hire us. We offer custom commercial snow plowing & removal solutions for our commercial clients right through the season. Whether you need snow plowing and salting for an office building, parking lot, shopping mall area, hospital, etc., we can provide unfaltering 24-hour snow plowing, relocation, and removal services right through the winter season. All of our technicians work efficiently and will clear the driveways, walkways, and parking lots before your business hours, ensuring you and your clients, customers and employees don’t face any inconvenience. Accessibility and ease are priorities for our company when we work with any of our commercial clients. We use salting and other de-icing techniques to make sure your property is clear of snow throughout the winter. Our trained and seasoned team is ready and on call to handle any type of snow emergencies. You can opt for a one-time or ongoing service. In case of the latter, we can design custom snow removal package, based on your specific needs. We are 100% insured for residential and commercial work and offer a reliable emergency response service. When you want professional services at very competitive snow removal cost, you need look no further than Keenkut Landscaping. You can speak with our experts at 413-896-9240 to discuss your project details or send us queries and quote requests through this Contact Us form and we will respond shortly.